Battlefield Hardline has finally rolled out its first major patch since the game's launch, squashing some bugs and making the usual assortment of gameplay tweaks along the way. Currently bearing the simple moniker “BFHL Patch #1,” some of you may be surprised to hear that this is the first major patch to arrive for Visceral Games and Electronic Arts' latest first-person shooter. The game launched on March 17, after all, meaning its been in players' hands for more than a month without the developer rolling out a big update. The reason for that may shock you, given the series' recent history: Hardline actually worked properly when the game launched. Hard to believe, given the launch state of most online-focused games these days, but true. Battlefield Hardline has been playable since day one, so Visceral didn't need to rush out patch after patch just to make sure people could actually log in and shoot their friends. Updates, up to this point, have been pretty small. As such, the game's first set of patch notes seems a bit bland by comparison. If it seems like I'm complaining, rest assured that is not the case. When it comes to online games, less necessary tweaks are always a good thing. The patch is live as of today but, given the fact that the notes are a few weeks old, Visceral's Thad makes note that additional, unlisted changes are being made, too. 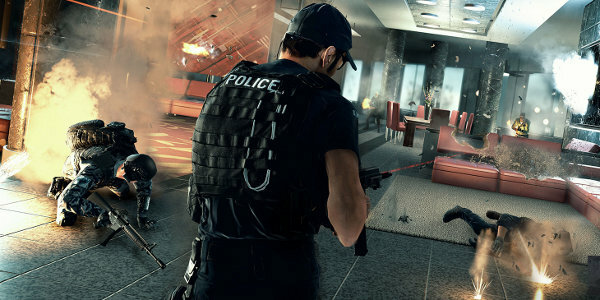 Some of the notable bug fixes for Hardline include a server crash fix when some players were in the middle of a Rescue. Blood Money's time limit can now be turned off by setting the counter to “0,” and now squad leader migration allows the new leader to actually kick members. A few console specific changes were also made. For the Xbox One, a fix has been made for players using the invite/join on friend after Quickmatching. Xbox 360 players should now also be able to invite friends while playing Rescue. And then there are all of the smaller gameplay changes being made to Hardline, which you can check out in the original listing. These types of fixes range from nearby bullet impact changes to the min/max damage of various firearms. In case your desired chang/fix isn't listed for Patch #1, Thad said that the team fully plans on continuing its support in the months ahead.